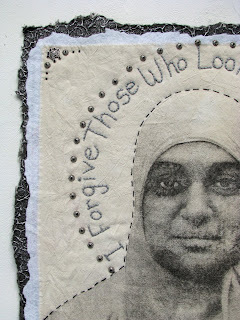 Art In Stitches: Muslim....and teaching at Saluda Shoals! Muslim....and teaching at Saluda Shoals! My studio is located at Gallery 80808/Vista Studios in downtown Columbia, SC. There are twelve other private studios and a large gallery, atrium, and hallways for outside individuals and groups to rent for their own exhibitions. This summer The University Painting Society held a show. One of the exhibiting artists was very interested in my studio and my work. She wanted to expand her artwork to include fibers. Well, I was as interested in her as she was in me. The moment I lay eyes on her, I hoped she would pose for this portrait.....and SHE DID! 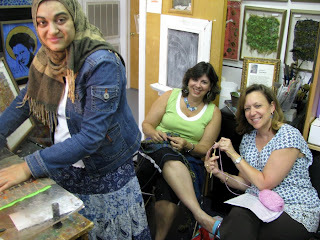 As a result, she came to the weekly, informal gathering of friends in my studio....a "stitch, knit, and talk session on Monday evenings. I introduced her to some fiber techniques and got the photo and signed model's release for the portrait. This portrait is a powerful work, an important addition to the series. We all talked about religious freedom....a value that founded this country; we all talked about how world conflict interferes with this fundamental right. We all agreed that tolerance is needed. A hijab is a headscarf worn by Muslim women. It conceals the hair and neck and sometimes the face with a veil for the eyes. The word in Arabic means "curtain / cover" and is based on the root حجب meaning "to cover, to veil, to shelter" It is worn over daily clothes in public and generally removed at home. It is similar to a burqa which Wikipedia describes as a garment covering most of the body as an outer garment. Burqa comes from the Arabic root /r/+/q/+/ʕ/ which means "to patch up" or "to sew up". Both are worn by Muslim women as a sign of modesty and religious devotion. Unfortunately, there are many people all over the world that look upon these clothing choices as something sinister and fearful. Personally, I simply see a fellow female who is proud to proclaim a faith that shares the same Old Testament as my beliefs. 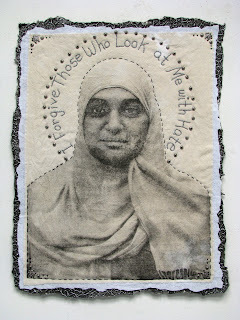 I hope this portrait when viewed by others, provokes thoughts about how to best respond to someone of another faith. I am happy to number this new "fiber enthusiast" as a new friends. Join nationally-known fiber artist, Susan Lenz, in this creative fiber workshop using needle and thread, fabric and beads. Create works of art using a heat-activated process and various types of fiber embellished with hand and free motion embroidery. Participants will leave with a finished piece suitable for framing.Maximum 18 participants. Dates: August 25, Sept. 1 & Sept. 8; 6:00-8:30 p.m.
For more information, call 772-1228 or visit www.icrc.net! You're right--this is a powerful piece--really beautiful! Have just finished my version of an 'in box' - how I wish I could come to your class! What an important addition to your series. Also congrats on the workshop!! Very powerful, indeed. I never looked at the Burqa that way. Thank you. The portrait itself is amazing....dark and light. Very fitting. And congrats on the show...you are actually, though, INTERNATIONALLY known!! !